Republic of Vietnam Ordnance Insignia. Top: Shoulder patch, printed cotton. Bottom: Qualification badge, silk woven in color (left); Qualification badge, hand embroidered in subdued (right). Circa 1960s-70s, RVNHS Archive. The Ordnance Branch of the Army of the Republic of Vietnam oversaw the distribution, management, and procurement of armaments for the armed forces. Members of ordnance units underwent specialist training at the Ordnance Training Center near Tan Son Nhut. Trainees who qualified would be awarded the ordnance qualification badge that was worn above the right pocket. 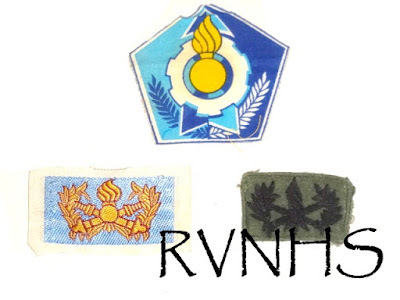 Variations of this badge included different colored variants in silk woven or printed cotton form as well as subdued and hand embroidered types. A metal version of the badge also existed. Those who completed courses at the Ordnance Training Center would either serve in units directly under the authority of the Ordnance Branch or as ordnance personnel in other branches of the armed forces. to disarm or destroy a simulated 105 MM round. Note the ordnance qualification badge on the soldier at center. 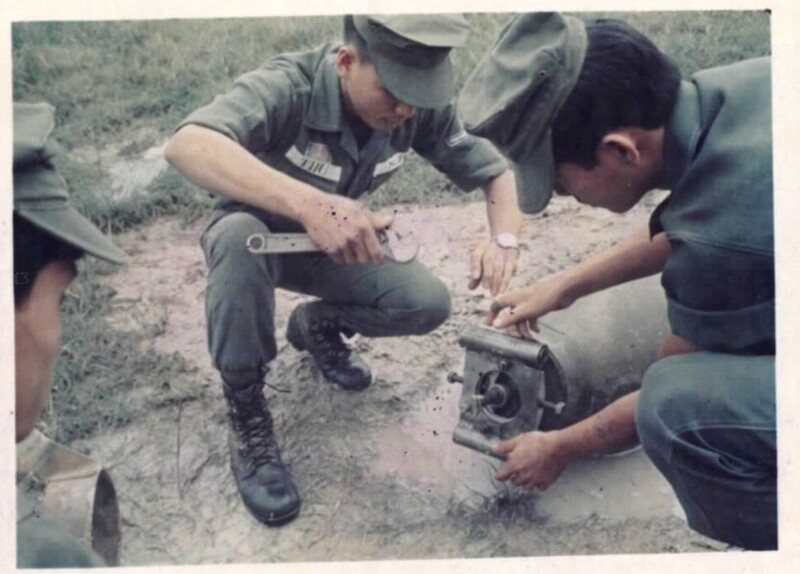 Aside from managing ordnance supplies for the republic's armed forces, ordnance personnel were also required to handle captured enemy weapons and disarm them as needed in addition to defusing faulty ordnance. The work was highly dangerous, and many ordnance personnel fell casualty to armaments as they attempted to remove and disarm them long after the related combat engagements had ceased. 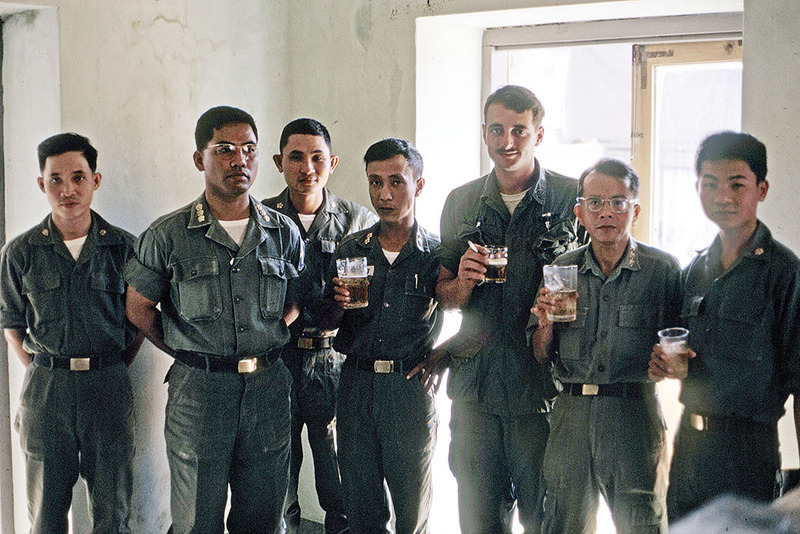 Republic of Vietnam Ordnance Officers of the 7th Ordnance Company of the 7th Division enjoy a break after a day's work in My Tho. The man second from left is identified as a "Captain Linh," commander of the 7th Ordnance Company. The American soldier is a member of the 61st Medical Detachment. 1967-8.
circa July and September, 1965, RVNHS Archive. These two valor citations pertaining to a Sergeant of the Republic of Vietnam 5th Division were recently acquired by RVNHS. 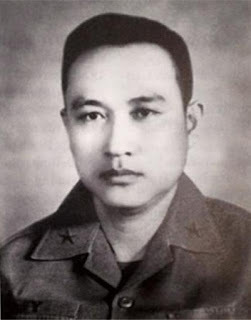 The sergeant's name was Vũ Đình Du. The first of the two citations is for general merit and is dated July 28, 1965. The second citation is for bravery during an operation in Bình Dương Province on September 9, 1965, in which the sergeant successfully located and captured a three hundred meter enemy tunnel, which included hidden mines. He also took three enemy prisoners in the process. The citation is dated September 14, 1975. Soldiers of the Republic of Vietnam 5th Division, circa mid-1960s. dated July 28, 1965, RVNHS Archive. dated September 14, 1965, RVNHS Archive. Both valor documents are signed by then 5th Division commander, (then colonel and later lieutenant general) Phạm Quốc Thuần. Citations of this type were awarded for exceptional efforts of bravery and service to a soldier's unit. 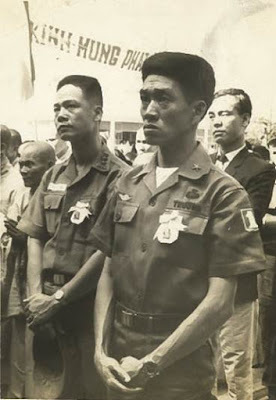 These two citations represent the valor of many regular soldiers of the Army of the Republic of Vietnam, and attest to their determination to observe their duty on behalf of their country. 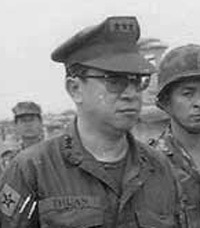 Lieutenant General Phạm Quốc Thuần, signator of both valor documents. 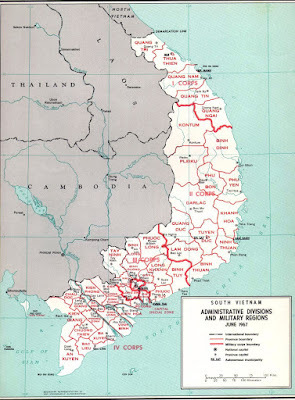 Map showing the provinces of the Republic of Vietnam in 1967. Bình Dương Province is located north of Saigon. Soldiers of the Republic of Vietnam 5th Division, circa 1969.
with military postal insignia, circa 1960s-70s, RVNHS Archive. 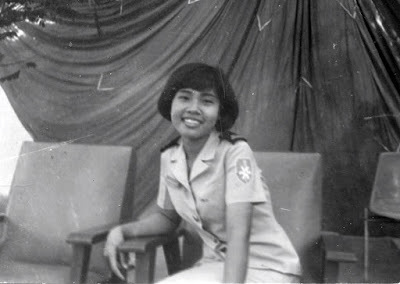 The Republic of Vietnam Women's Army Corps ( Đoàn Nữ Quân nhân Việt Nam Cộng hòa ) was the principal branch of service for women who served in the Republic of Vietnam Armed Forces. 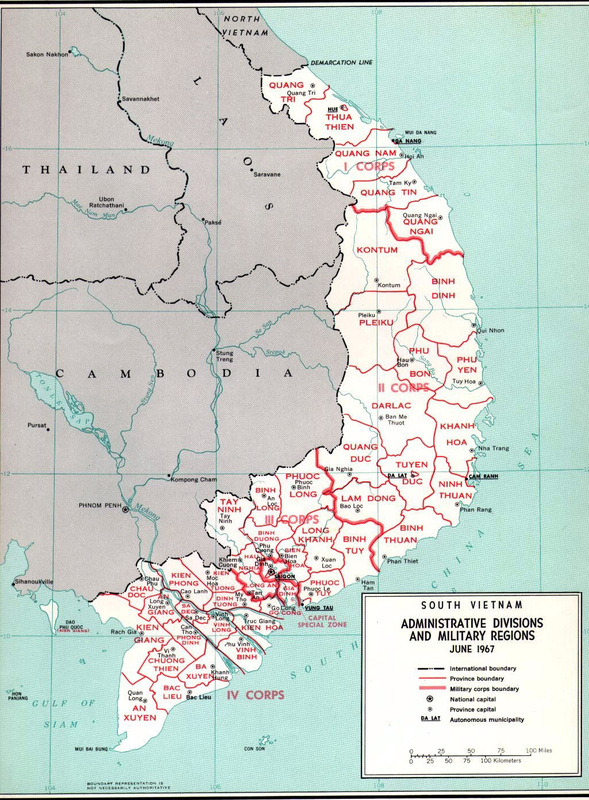 As with many branches of the republic's military, its history goes back to the State of Vietnam period prior to the establishment of the republic. Women who volunteered for service in the corps first received general training before commencing specialized programs for the specific element of the armed forces they would be attached to. Women's Army Corps members served alongside all branches of the armed forces ranging from the regular army to air force, navy, and marines. and Lieutenant Colonel Nguyễn Thị Hạnh Nhơn (second from right). Lieutenant Colonel Nguyễn Thị Hạnh Nhơn. 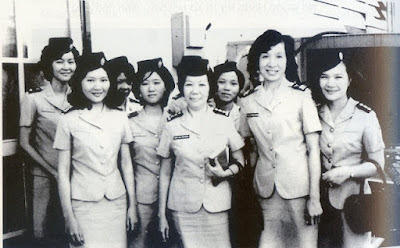 The standard service uniform for women in the corps from the mid-1960s onwards was a sky blue service uniform consisting of a four-button two-pocket short-sleeve shirt and a matching skirt. Olive drab fatigues, camouflage patterns, and other uniforms worn by service personnel of the republic can also be seen in use by members of the women's corps on occasion in contemporary photographs, although the sky blue service uniform was the standard. Warrant officer in the Republic of Vietnam Women's Army Corps. 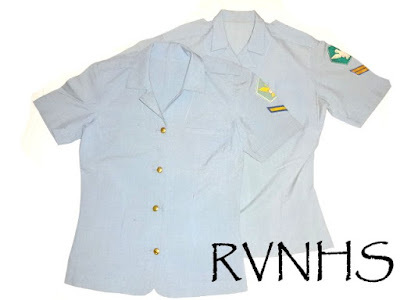 The two sky blue service uniform tops shown here have insignia for the republic's military postal service. This was the internal mail service for members of the armed forces. One shirt has senior private rank while the other is for a full corporal with one military postal service patch in printed form and the other in silk woven. 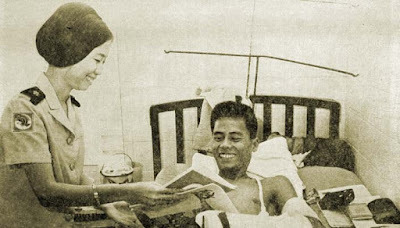 Second lieutenant Hà Thị Tươi visits a wounded soldier in hospital. 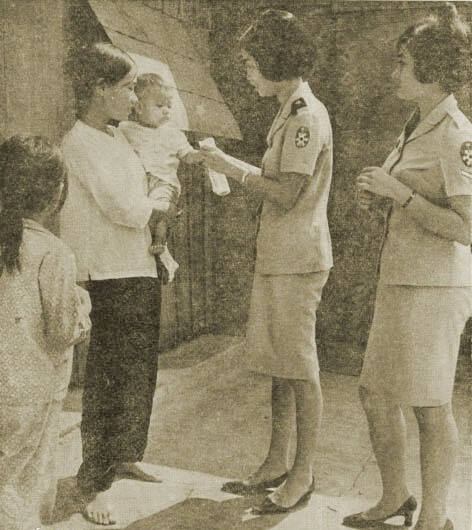 Second Lieutenant Hà Thị Tươi and Senior Private Dinh Thi Phan visit dependents of airborne soldiers near Tan Son Nhut airbase. Republic of Vietnam airborne troops en route to An Lộc, April 14, 1972. This week marks the 45th anniversary of the Battle of An Lộc. 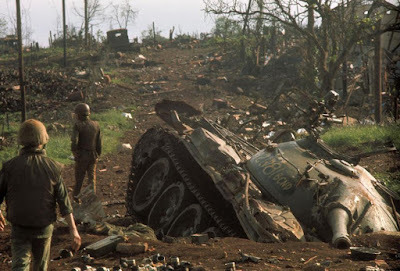 The battle was part of the failed Communist offensive against the republic in 1972, sometimes referred to by historians as the "Easter" or "Spring" Offensive. 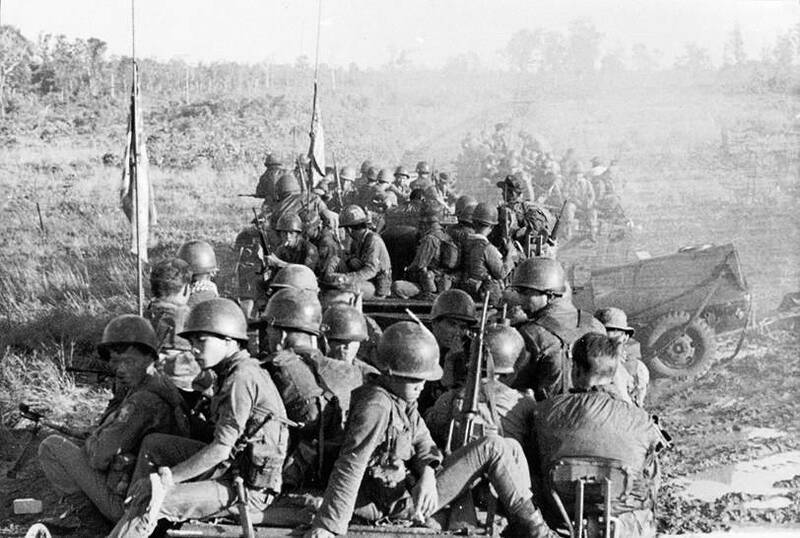 The campaign saw tens of thousands of enemy troops thrusted against the military and civil strongholds of the Republic of Vietnam. After weeks of fighting, the republic was able to gain the upper hand and achieve victory. The Battle of An Lộc was a pivotal part of this campaign. 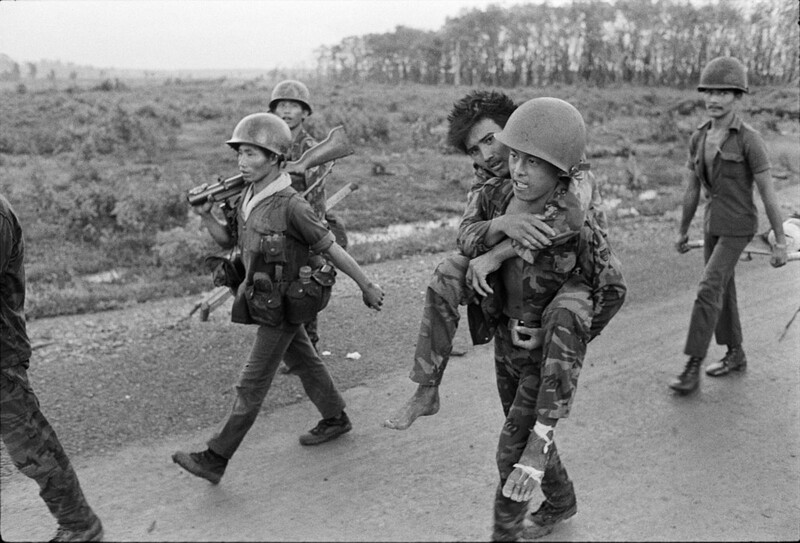 Wounded defenders are escorted from the frontline, Battle of An Lộc, 1972. Destroyed enemy tank at the Battle of An Lộc, 1972. An Lộc was a town in Bình Phước Province, and was located roughly ninety kilometers from Saigon. 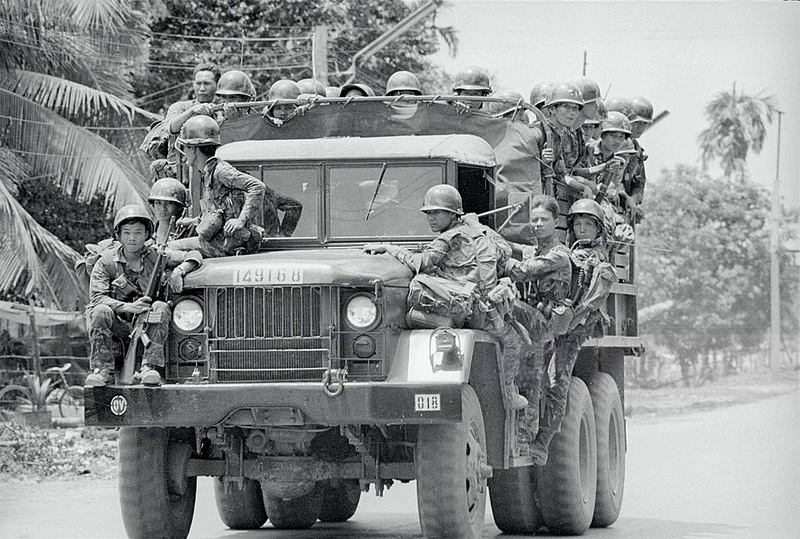 In April of 1972 regular Communist forces based across the border in Cambodia launched an assault into the republic following Highway 13 towards Saigon. The Republic of Vietnam decided to make a stand along the highway at An Lộc. The town was quickly surrounded by the enemy and put into a state of siege. The defenders consisted of a mixture of units of the republic's regular army, rangers, Regional Forces, Popular Forces, and People's Self Defense Forces. The defenders were later reinforced by airborne troops and members of the 81st Ranger Group. Air support was provided by Vietnamese Air Force and United States Air Force units. 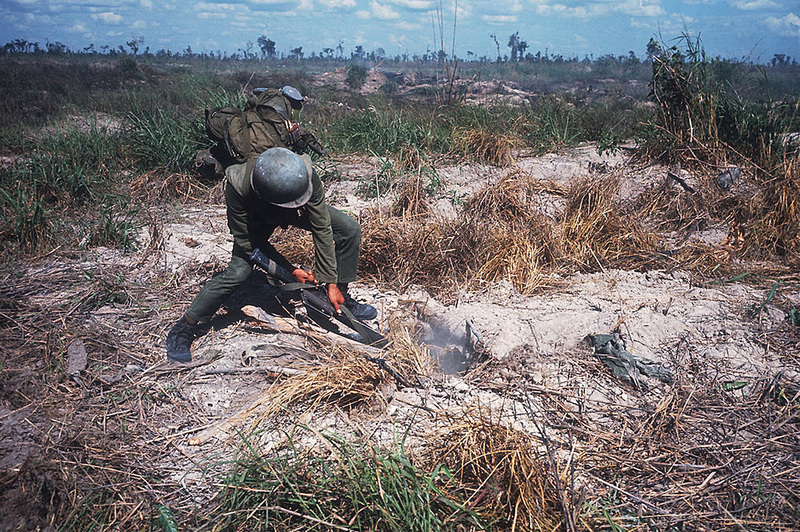 A defender clearing a tunnel during the Battle of An Lộc, May 22, 1972. Defenders admist the ruins of what was once the main square of An Lộc, 1972. The Battle of An Lộc lasted for sixty-six days. The defenders were outnumbered nearly five to one. The battle saw continual attempts by the enemy to capture the city, including mass armor assaults. For most of the battle, the defenders could only be supplied by air. Despite fighting under conditions of meager supplies and reinforcements the defenders stood their ground. The enemy eventually was forced to retreat in July, and the victory at An Lộc became a rallying point for the republic. The commanders of the defenders of An Lộc were lauded. These included General Lê Văn Hưng, General Lê Nguyên Vỹ, and Colonel (later general) Trần Văn Nhựt. Generals Hưng and Vỹ were later among the senior officers who chose to commit suicide on April 30, 1975, rather than surrender to enemy forces. 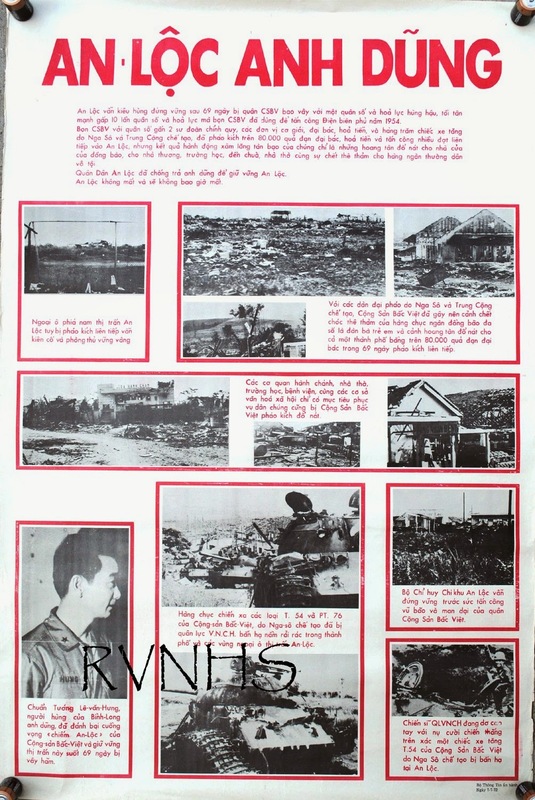 Poster issued by the Republic of Vietnam announcing the victory at the Battle of An Lộc,1972, RVNHS Archive. 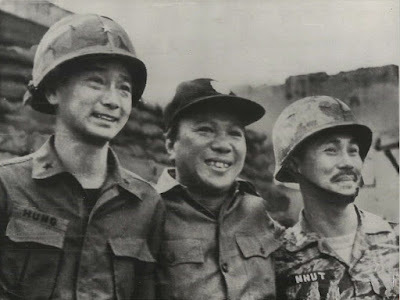 President Nguyễn Văn Thiệu (center) visits An Lộc as victory was being declared. 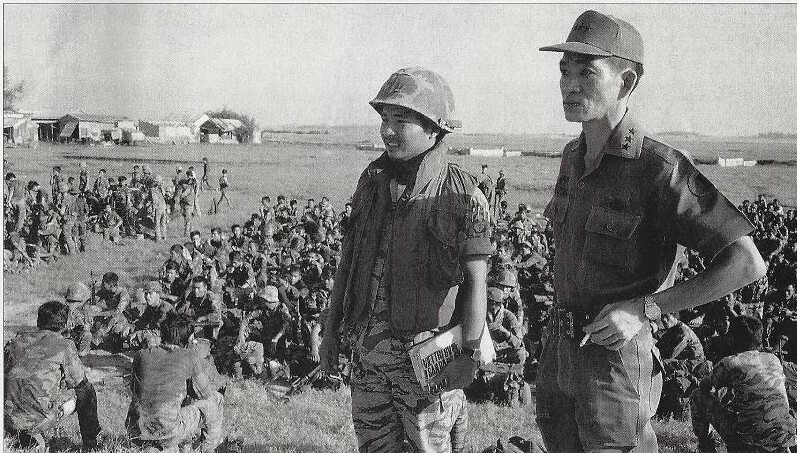 He is flanked by General Lê Văn Hưng (left) and Colonel Trần Văn Nhựt who were among the battlefield commanders at An Lộc, July 7, 1972. 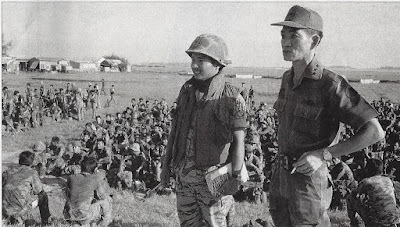 General Lê Nguyên Vỹ, one of the republic's commanders at the Battle of An Lộc, 1972. In this post, RVNHS would like to commemorate the commencement of the 45th anniversary of the Battle of An Lộc. We would like to pay homage to those who sacrificed all on behalf of the republic and honor their memory by insuring their legacy and triumph is not forgotten. 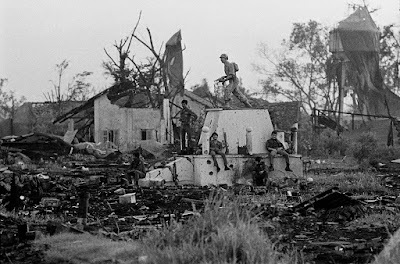 who endured the siege during the battle, June 18, 1972. This camouflage cap was recently acquired by RVNHS, and is currently on display at the Museum of History of the Republic of Vietnam Armed Forces in Westminster, California. This rare piece of headgear was worn by a full colonel of the Republic of Vietnam airborne. 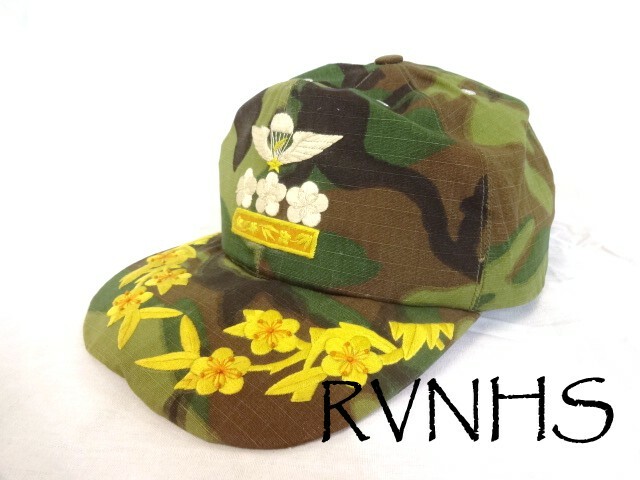 The cap is comprised of a mixture of Vietnamese camouflage patterns, and bears colored embroidered insignia. The embroidery consists of blossoms signifying a field officer rank along with the insignia for full colonel and master jump wings. The cap was made by a tailor in Saigon. in camouflage "baseball style" cap with metal colonel rank and jump wings accompanied by subdued blossom wreaths on the brim. Note the crown-pointed camouflage cap with rank and wings worn by the captain at far left. Caps of this type are sometimes referred to as "baseball caps" due to the pattering of cut. Crown-pointed field caps were also worn. Period photographs show that both types were in use by members of any branch of the armed forces. 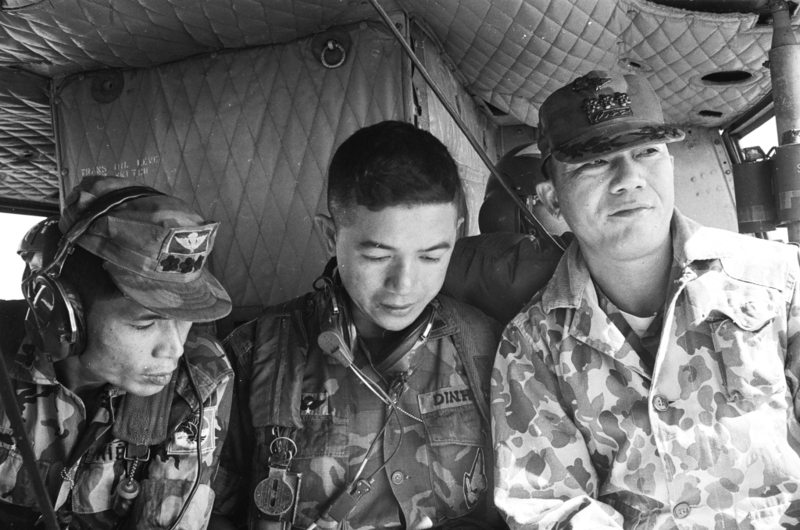 Airborne personnel can be seen wearing both types of caps in a variety of camouflage patterns or olive drab. It was common for members of the airborne, especially officers, to have jump wings and/or rank worn on these caps. The insignia could be either colored or subdued as well as take form of embroidery, sewn on cloth or silk, or affixed metal insignia. Republic of Vietnam Airborne Colonel Phuoc Vinh Truong in camouflage "baseball style" cap with subdued embroidered colonel rank, jump wings, and blossom wreaths. Lieutenant General Ngô Quang Trưởng in the 1970s. December 13th marked the birthday of one of the most well known commanders in the Republic of Vietnam Armed Forces, Lieutenant General Ngô Quang Trưởng. Trưởng was born in Kiến Hòa province in 1929. He entered the military during the State of Vietnam period, attending the Thủ Đức Academy. He received his commission in 1954, and entered the airborne. One of his first citations for merit was awarded to him for bravery during the Battle of Saigon in 1955 against the Bình Xuyên. 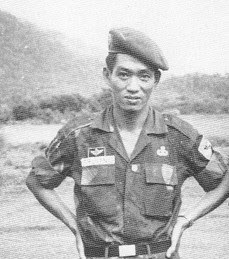 Trưởng as a major during his early years with the airborne, 1960s. In subsequent years, Trưởng continued to be promoted for military achievement and his capabilities as a commander. He served with the airborne through the mid-1960s with distinction, pariticipating in major engagements throughout. After twelve years, he was transfered out of the airborne to take over command of the republic's 1st Infantry Division. He later went on the be a corps commander and one of the leading figures of the armed forces. 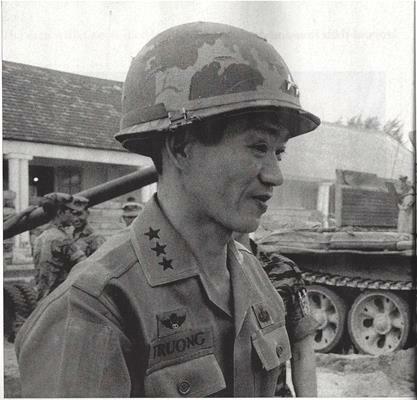 Brigadier General Trưởng with the 1st Infantry Division, 1960s. during the 1972 campaign, June 29, 1972. General Trưởng was regarded by many of his contemporaries as one of the most capable commanders in Southeast Asia. He played a central role in the 1972 victory against the Communist invasion. He served the republic through 1975. He later lived in Virginia in the United States where he authored several texts documenting his views on the war. 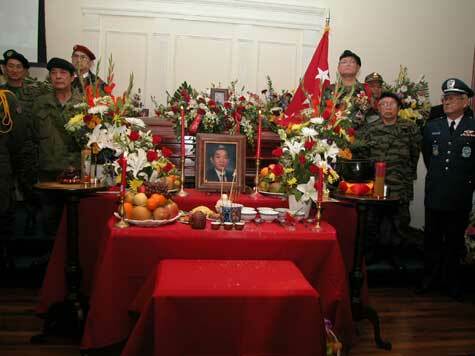 General Trưởng passed away in 2007. 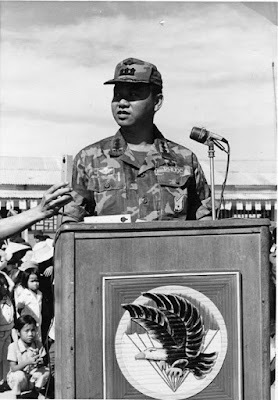 In this post, RVNHS would like to reflect on the life of General Trưởng and his role in the republic on the occasion of what would have been his 87th birthday. Funeral of Lieutenant General Ngô Quang Trưởng in 2007. 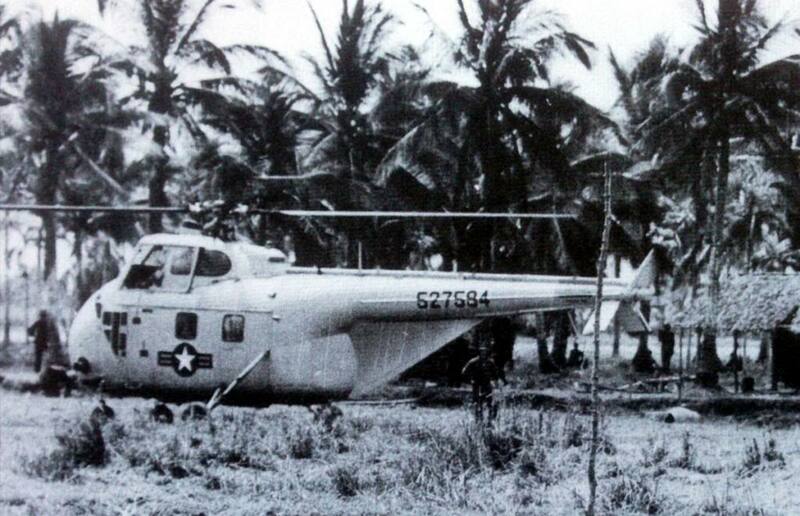 A rare photo of a Vietnamese Air Force H-19 Helicopter during an operation in the early years. The helicopter is undoubtedly one of the most iconic images of the conflicts in Southeast Asia. The Vietnamese Air Force (VNAF) was heavily involved with the helicopter war, and at its height included over twenty helicopter squadrons. 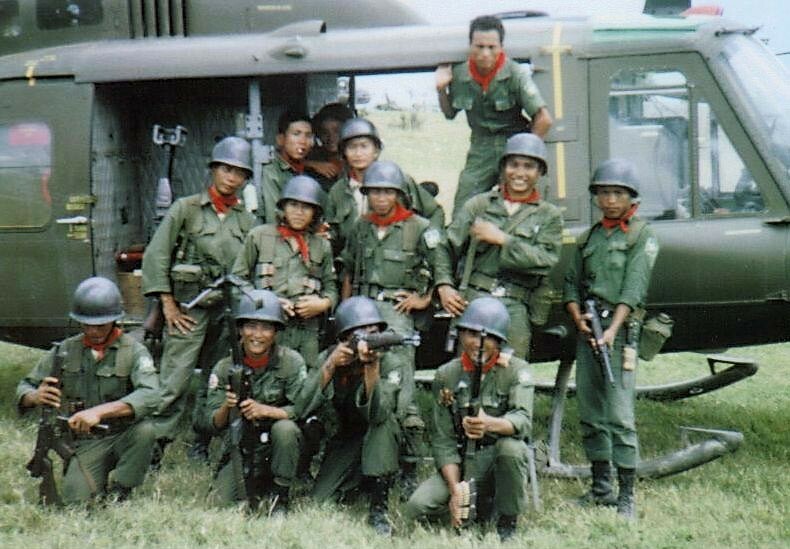 The birth of the VNAF's helicopter squadrons coincided with the founding of the Republic of Vietnam. The 1st Helicopter Squadron of the Vietnamese Air Force was established at Tân Sơn Nhứt in April of 1956. 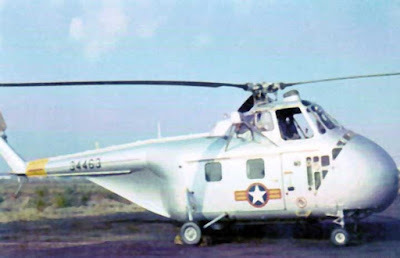 An H-19 Helicopter of the Vietnamese Air Force. The squadron initially did not have any aircraft. Helicopters had been used in Vietnam during the State of Vietnam period, but by 1956, those that were left were in need of repair and were fastly becoming outdated as innovations in helicopter designs boomed worldwide. The first new helicopter received by the 1st Helicopter Squadron was the updated Sikorsky H-19 Chickasaw. These helicopters would be the main operational helicopters of the squadron in its very early years. The men of the 1st Helicopter Squadron were the pioneers for the later helicopter airmen and squadrons of the VNAF. In 1963, the squadron was redesignated the 211th Squadron, and would continue to serve the republic through 1975.